In August we journeyed with a mix of JAM clients and editors on a four day trip to the San Juan Mountains of Colorado, giving editors an opportunity to meet the people behind the products of JAM clients Osprey Packs, OtterBox, Smartwool and Vasque Footwear. Hosted by the San Juan Mountain Guides, we traversed the Via Ferrata, trekked up Black Bear Pass and scrambled to the summit of Red Mountain 3. Upon arriving in Montrose, CO, we headed to the Uncompahgre River for an afternoon of fly-fishing followed by dinner, hot springs and enjoying local trails. Telluride’s Via Ferrata - which is Italian for ‘iron road” - offers the ability for participants to experience the thrill of traveling through the mountains in an exposed setting with the protection of cables and steel/iron rungs. 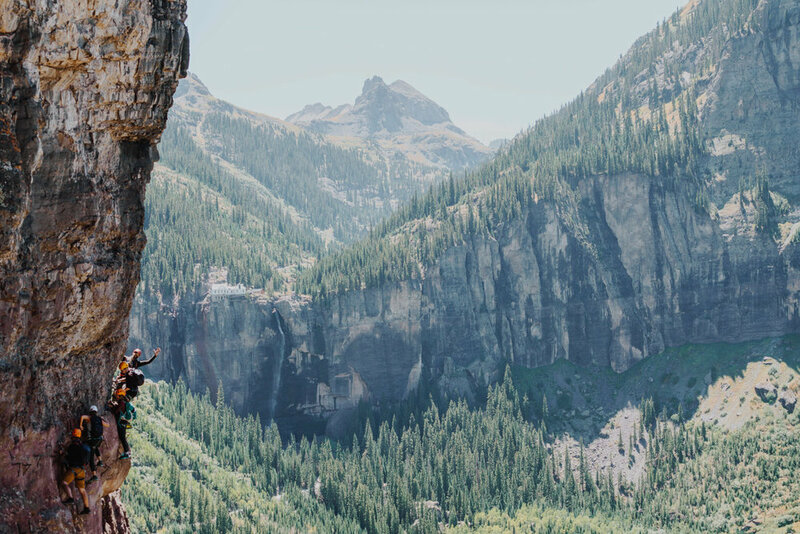 The position and setting of the Telluride Via Ferrata offers breathtaking views of the town of Telluride, the surrounding mountains, and the iconic Bridal Veil Falls. Craving more views after the Via Ferrata, we hiked over eight miles to Black Bear Pass. At the 12,840 foot summit, we were greeted with a vast overlook of the San Juan Mountains landscape and the valleys below. The group hiked to the summit of Red Mountain 3, where we enjoyed snapping pictures of the vistas before the group traversing over to the private lodge owned by the San Juan Mountain Guides. After a round of axe-throwing (yes, AXE-THROWING! ), the group was treated to an excellent dinner and a campfire with s’mores. We’re so thrilled to have collaborated with JAM Clients Osprey Packs, OtterBox, Smartwool and Vasque Footwear on this event and are so thankful to San Juan Mountain Guides for the local knowledge! Lastly, we’re thrilled that so many of our writer and editor friends could journey out to Colorado for an amazing San Juan JAMboree. All photos are courtesy of Charles Gage.